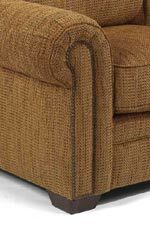 Chair: This beautiful chair is perfect for extra seating in your living room or as a reading chair next to a fireplace. It is very versatile with 1,000 different upholstery options. You can design your living room knowing you have a quality product that will last you a lifetime. Ottoman: This gorgeous Ottoman is the answer to your needs. It is a great addition to your Harrison living room and is very versatile. There are over 1,000 different fabrics to choose from. This piece is made with quality construction you can count on and will last for years to come. The Harrison Upholstered Chair and Ottoman by Flexsteel at AHFA in the area. Product availability may vary. Contact us for the most current availability on this product. 3270-10 Chair 1 45" 40" 40"
3270-08 Ottoman 1 31" 23" 18"
Arm In and out arms lined and padded for ultra comfort. Seat Back Optional lumbar support provides four degrees of adjustable firmness for lower back comfort. Seat Flexsteel patented Blue Ribbon Seat Springs or DualFlex Spring System® mounted in the tubular steel frame and guaranteed for life.